After last year's first, great Tahko MTB experience, it was clear to me that I would do it again this year, and in the longest distance, which was this time 180 km (three 60 km laps). The spring and early summer were busy times for me with other things, and on top of that I got sick with a nasty flu three weeks before the race. Tahko MTB 180 would be just part of my training program for next year's Rovaniemi 150, so I didn't have high expectations, but I was fairly confident that I could ride to the finish under the time limit. After all, I had a great winter and successful Rovaniemi 150 race. 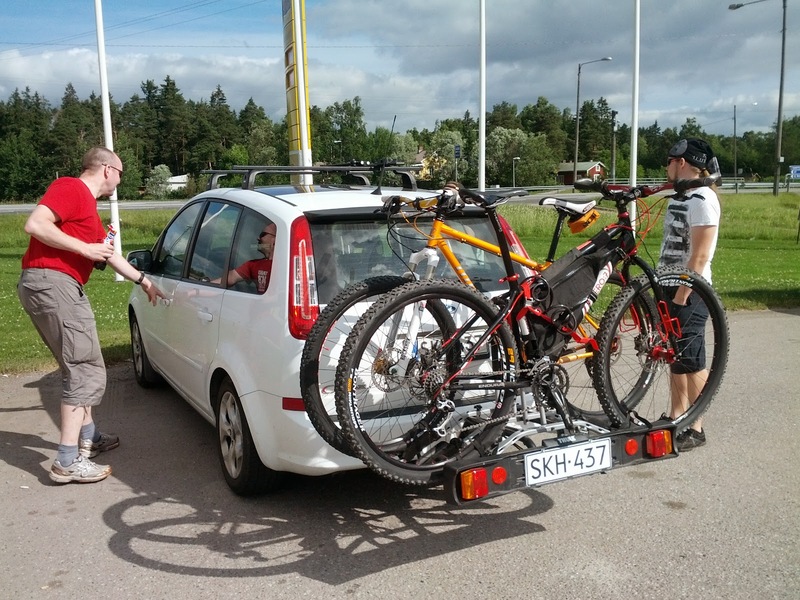 I joined again MTB-Turku for the car trip and accommodation, which works like a Swiss clock. After last year's absence, Peter was participating again this year and drove the car. The other usual suspects in the car were Matti H and Greenman. A long car trip is never boring with Matti's great stories! We prepared our bikes at the cottage. Teemu in the left and Peter in the right with their Salsa Mukluks. I was going to ride with my fatbike too, but with a 29er wheelset. The rest of the evening consisted lots of eating and chatting about the forthcoming race. The night was hot and short, as we wake at 3:30 for the start at 5:00 in the morning. After the start it felt like I had eaten a little too much in the evening. This wasn't a big problem, I was just slightly slower for the first hour or so that I wanted. After the first big climb, Kinahmi 1, I felt much better. The race route was very dry and fast compared to last year. There were 44 rides in the 180 km class, so no traffic jams for the first lap, at least. Kinahmi 1 is followed with a rocky trail section to the descent. It went fairly well but I was still slightly too slow. The descent went really well. I cruised comfortably the fast transition to Kinahmi 2, "The Stairway to heaven". It so steep that it has to be pushed. After that, the next trail section was difficult because the sun was directly in my eyes. I rode too slowly again. All in all, the trails of Tahko are rocky as hell. The next obstacle was Tuulivaara. Yep, I was too slow there too. I didn't have cycle computer on the handlebar. My smartphone was inside the framebag, with RunKeeper tracking my progress. But it felt clearly that I was behind the schedule. I should do the first lap around 4 hours, so that I would have 5 hours 15 minutes to complete the second lap. The last climb on the lap, El Grande, is great, but I couldn't ride it all the way to the top. It really started to feel that there is no point to continue after first lap. At the transition area I checked my smartphone. The first lap took 4 hours 19 minutes. My mind was instantly changed! I thought that I still had a small chance to complete the second lap just under 5 hours and be able to continue to the last lap. I filled my CamelBak at the service, took new sports drink bottle and drank a can of coke as I rode in to the second lap. I'm pretty sure that I was faster in the second lap before Kinahmi 1, riding felt rather good. But on top of Kinahmi 1 I was again too slow. The heat (+28°C) started to take it's toll. The fast transition to Kinahmi 2 went too slowly. I was really looking forward to Kinahmi 2, not because the climb, but because there is a water spring to cool my head. After that, things felt slightly better, for awhile. Obviously my energy level was too low on the Stairway to heaven, because it felt more like Stairway to hell. I was also in the midst of the 60 km riders. Some of them were giving encourage for me which was very nice. But man, at times I was dying on the race course! At the finish there was some confusion about me. Probably the organizers didn't expect that there are any more 180 km riders in the second lap. Anyway, in the end of my second lap I didn't feel too tired. I could have continued for the final lap, but I was outside the time limit. Game over. This DNF is the first for a long, long time. It isn't a huge surprise, but I have handled many difficult moments in many endurance races before, so I thought I could do that magic trick this time too. But no. I didn't have enough respect for the very demanding race course and the lack of training in the spring was the major reason for the bad result. I'm disappointed. On the return trip in the car even the sunshine and warm started to irritate me, and I was longing for the darkness of polar night, subzero temperatures and blizzard conditions. But I have already found something good about this experience. I'm now even more hungry and motivated to train hard for the Rovaniemi 150 next year, and there is also a chance to take a rematch in Tahko MTB in the longest distance of 240 km. Without this ordeal, I could have prepared too lightly for Rovaniemi 150. Otherwise, the Tahko trip was again great with the company of MTB-Turku. The social part has a big meaning for me. Thanks again! Check out also Peter's excellent report here. 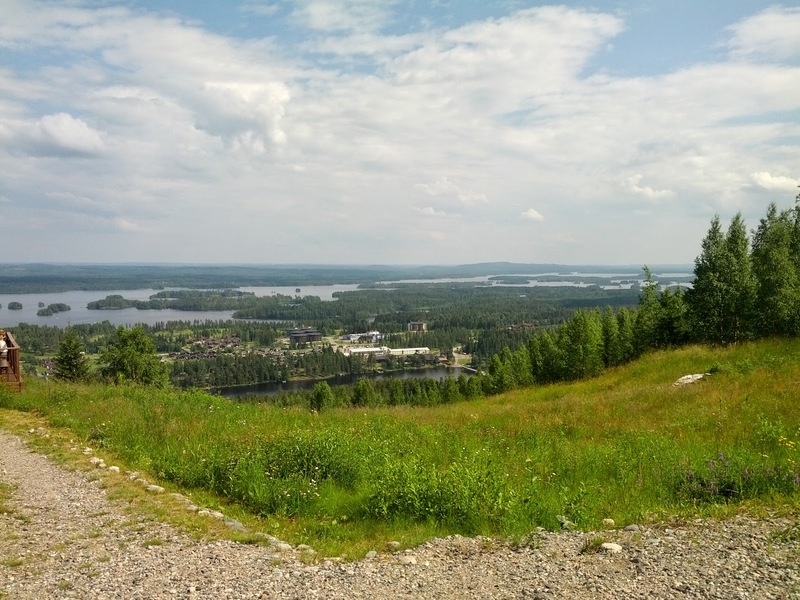 For Finnish readers, there are also the reports from Greenman (he was the only one of us to finish 180 km) and Teemu and slightly short write-up of Matti H.